It's like the George Foreman grill of bacon-specific cuisine! We have firm rules for what we cover in T3's news section. It must be stylish, premium, technologically on the cutting edge, or involve bacon. Mmm, bacon. The Bacon Express grill has been, we are assured, a sensation in the States, where bacon is closer to a religion than a foodstuff. It is, essentially, a George Foreman grill… but for bacon. 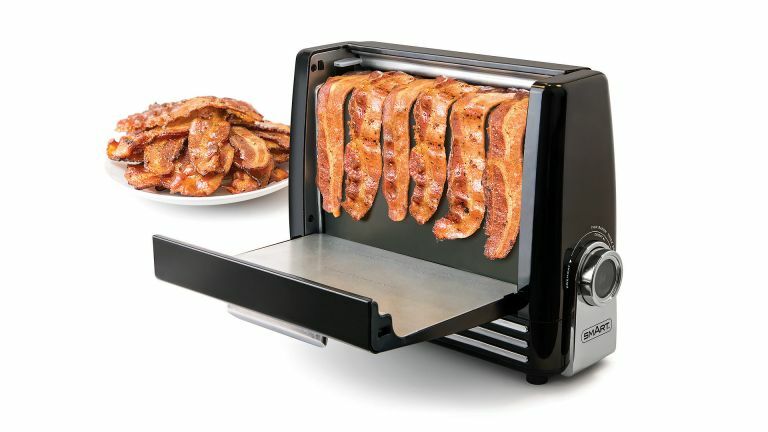 Or perhaps one might also view it as a toaster… but for bacon. The Bacon Express cooks 'up to six' slices of (quite narrow) bacon, draped sexily over a cooking plate, which heats up in 2-3 minutes. Access is easy, as both sides flap down, like a badly broken toaster. Once you've adjusted the crispiness dial to your preferred setting, cooking then takes about 10-12 minutes. The Foreman-esque drip tray slides out for easy cleaning, as do the cooking plate and metal sides. All of this may sound like considerably more hassle than using a frying pan, but consider this (from the press release, obviously): "In traditional cooking methods, bacon is fried in its own fat, making it less healthy, as well as prone to shrivelling." However, with Bacon Express, the combination of gravity and its like-a-clothes-drying-rack-but-for-bacon design means fat just runs off, filling the drip tray below, to spread on your bread later or, if you're some kind of fussy kill-joy health nut, throw away. Bacon Express also claims to "cook bacon up to twice as fast as in a pan," although if its 'Express' cooking takes 10-12 minutes, that sounds like a lie; we're pretty sure it's never taken us 20-24 minutes to cook bacon in a pan. It also means that you no longer need a stove to cook this most delicious of pork byproducts. So in theory you could have one in your workplace and, as Bacon Express rather optimistically puts it, "instantly become the most popular person in the office!" Further features include an "Illuminated cooking dial with timer" and, "Cool-touch handles for safety."